Earlier in the year (the months leading up to March 2018), I messaged on here about months of internet problems, eventually being helped over the phone by someone called Stephanie (I can't remember her username). The speed cap was removed and an engineer apparently fixed an external problem; the connection got a lot better, it still dropped sometimes but the speed increased a lot. Early last month, the router had to be temporarily unplugged and moved slightly; after which the drop outs became more frequent, but the speed was good so it was fine. Then a couple of weeks ago, while it was raining heavily, it dropped out six times in a row and the speed has dropped to as low as 0.25mb/s. Weirdly, it doesn't seem to have been capped (I think I can tell by how the needle on the speed test goes) it's just really slow. The details are below. Hi @nickouk Sorry you are having a problem with your broadband connection. Hi @nickouk Sorry about that. Please check now and it will be there. Thanks a lot, it appeared this time and I filled out the form- cheers! @nickouk my tests have picked up a fault with your line which has been sent to the engineers to investigate further. Are you having any problems making or receiving calls on the land line? I'll be back in touch tomorrow with an update. We pretty much don't ever use the landline phone for making calls, it's only there because BT told us to plug one in. The line, however, is incredibly crackly, as it has been since we moved in two years ago, even when the internet is working fine. UPDATE: When I picked up the phone to see if the line was crackly, the internet dropped for a few minutes (orange flashing light on router). @nickouk Thanks for getting back to me, I tried calling you this morning but got your voice mail. Any noise on the line will impact the broadband and cause problems with it. The tests indicate that the source of the fault is either in your home or very close and I’d like to make sure that it’s not your own wiring or equipment causing the noise. 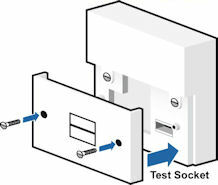 Would you be able to plug a known working phone directly into the test socket and call 17070 and choose option 2. This is a specific test for noise on the line and if it’s still noisy in the test socket then the fault is likely to be on the line outside.